Isn't Just For The Birds! Each year, millions of cats are run over by cars, mauled by dogs, poisoned and lost. Hundreds of millions of birds and small mammals are killed annually by free-roaming cats. The suffering of both cats and birds is all the more tragic because it is so unnecessary. Cars - Millions of cats are run over by cars each year. Seeking warmth, outdoor cats crawl into car engines and are killed or maimed when the car is restarted. Motorists risk accidents in attempting to avoid hitting free-roaming cats. Animal Attacks - Torn ears, scratched eyes, abscesses, internal injuries, diseases, and sometimes death result from encounters with dogs, other cats, and wild animals like raccoons, coyotes and foxes. Human Cruelty - Each year, animal shelters and veterinarians treat cats who have been shot, stabbed, or set on fire. Unsupervised cats may also be captured and sold to research laboratories or used as “bait” to train fighting dogs.Overpopulation - Unaltered free-roaming cats are the single most important cause of cat overpopulation. As a result, millions of cats for whom there are no homes must be euthanized each year.Disease - Cats allowed outdoors risk exposure to fatal diseases, including rabies, feline leukemia, distemper, and feline immunodeficiency virus (FIV). Vaccines are not 100 percent effective. Parasites - Cats allowed outdoors are more likely to contract debilitating parasites such as worms, ticks, mites, and fleas. Poisons and Traps - Exposure to pesticides, rodenticides and antifreeze poisons and kills thousands of outdoor cats each year. Cats are maimed and killed in traps set for furbearing animals. Today, birds and other wildlife face more obstacles to their survival than ever before. Wildlife habitats are destroyed and degraded every day, and many species are declining as a result. Even the impacts of natural predators on their prey is changing based on how humans are altering natural environments. And the presence of an unnatural predator — the domestic cat — is having an impact as well.Scientists estimate that cats kill hundreds of millions of birds each year and three times as many small mammals. Most birds killed by cats are members of relatively common species, like the Northern Cardinal, Song Sparrow and Dark-eyed Junco; others are rare and endangered — the California Least Tern, Piping Plover, Western Snowy Plover and California Gnatcatcher. Regardless of the status of the species, each wild animal suffers when captured by a cat. By letting our cats outside, we — perhaps without intent — place a higher value on the freedom of our pet than on the life of that cardinal, that chickadee or that chipmunk she kills. A descendant of the wild cat of Africa and southwestern Asia, the domestic cat instinctively hunts and captures prey. However, wildlife in the Western Hemisphere did not evolve in the presence of a small, abundant predator like the domestic cat, and thus did not develop defenses against them. Cats were introduced in North America by European immigrants only a few hundred years ago.While cats may instinctively hunt wildlife, it is clear that they are not adapted to life in the wild as are our native wild cats like the bobcat and mountain lion. Outdoor domestic cat populations are most commonly found in and around human settlements; most do not survive without direct or indirect support by humans. They are in this way very different from native predators. We all know that cats don’t have nine lives, but there are three other myths about cat predation we’d like to dispel. “Belled” cats do kill wildlife. Cats with bells on their collars can learn to stalk their prey silently. Even if they don’t, wild animals do not necessarily associate the ringing of a bell with danger. Even well-fed cats kill wildlife. The urge to hunt and the urge to eat are controlled by different portions of the cat’s brain. Once caught by a cat, few birds survive, even if they appear to have escaped. Infection from the cat’s teeth or claws or the stress of capture usually results in death. 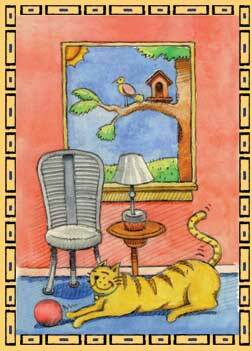 Provide a safe, outside enclosure, such as a screened porch.Provide window shelves to permit cats to monitor the outdoors from the safety of the indoors.Play with your cat each day. Paper bags and cardboard boxes are sources of unending delight when you are away. Plant kitty grass (available from pet supply stores) in indoor pots so your cat can graze. Where such programs exist, license your cat. Support local cat control and protection plans;Support legislation requiring cat owners to register their cats and prevent them from roaming;Do not feed unowned or free-ranging cats without making a commitment to giving or finding them a permanent indoor home; andTake cats for whom you cannot care to your local animal shelter to give them the best possible chance of adoption into loving, lifelong homes. Support efforts in your community to protect wildlife and their habitats. All wild animals have three basic needs: food, water and plants that provide escape cover and nesting sites. If you feed birds in your yard, locate feeders away from windows and brushy vegetation that permits neighborhood cats to hide. Keep your feeders clean and well stocked. Where possible, establish a brush pile for wildlife away from feeders. Avoid using pesticides. Cats cannot be blamed for killing wildlife. It is the responsibility of cat owners to ensure that their cats are safely indoors. The Humane Society of the United States (HSUS), American Humane Association (AHA), and other groups are working with American Bird Conservancy (ABC) on “Cats Indoors! The Campaign for Safer Birds and Cats.” Through this campaign, we will educate and encourage cat owners to protect cats, birds and other wildlife by keeping cats indoors.